I think I was born with an old soul. I love seeing time as it was. A more simple life. When I was younger or before I was born. 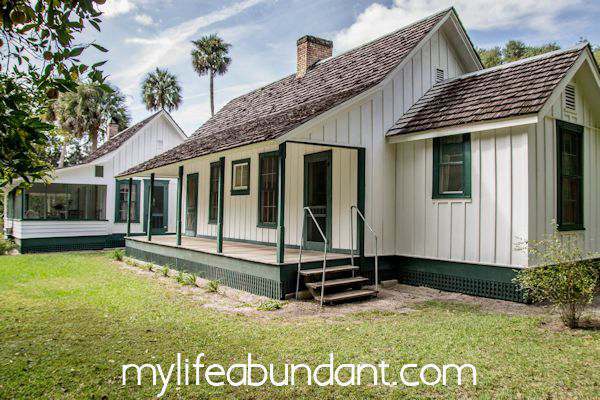 Recently, I was able to step back in that era when hubby and I had the great pleasure of touring the Marjorie Kinnan Rawlings home in Cross Creek, FL. All I knew about Marjorie Rawlings was that she wrote the Pulitzer Prize-winning book called The Yearling and Cross Creek. Both books are classics and the movies are family favorites. I also had no idea that she lived and wrote the book so close to us. I just had to go and see her home in Cross Creek. 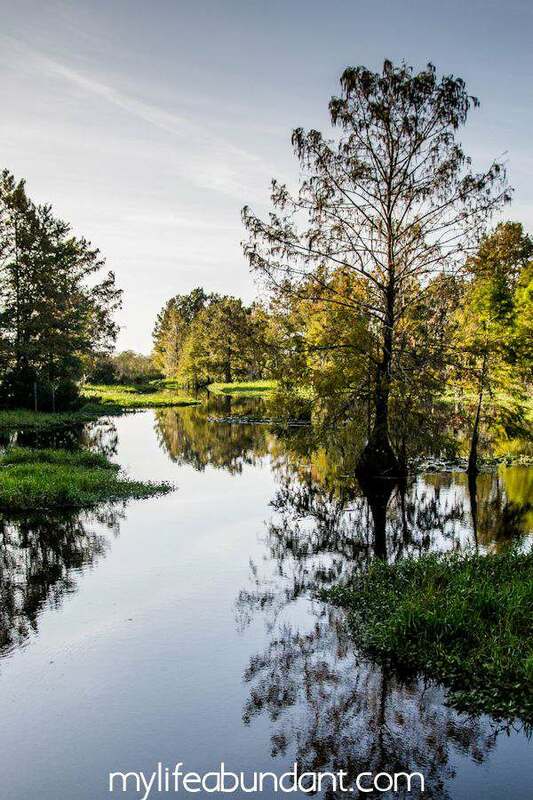 A very small and secluded community a few miles south of Gainsville, FL. When we walked through that gate, it was like we walked back in time. 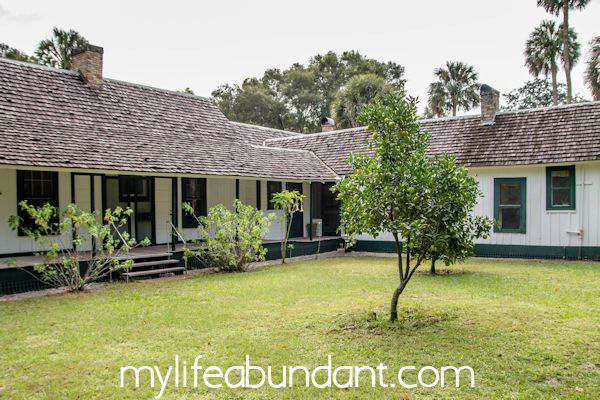 Her working farm is still maintained by the State of Florida as it was when she lived there. The barn, house, tenant house, small orange grove, garden, chickens, and geese look just the same as they did when she lived there. A bit about Marjorie before I go on. 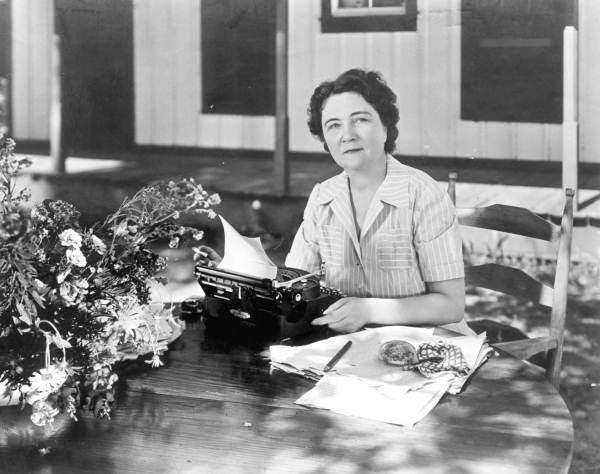 Born in 1896 in Washington DC, she knew she wanted to be a writer by the age of 6. She came to Florida for a visit and loved the area so much, she decided to move there. With a small inheritance she received from her mother, in 1928, she bought a 72-acre orange grove “sight unseen” in an area where it was mostly swamped land. Her husband helped her for 2 years with the homestead and realized Florida swamp life and farming was not for him. He packed up and went back north to leave Marjorie there to fend for herself. But as luck would have it, when her lawyer came from the Tampa area with her divorce papers, he stopped by a friends home, Martin Baskin, to see if he would like to join him on his journey. Several years later, Mr. Baskin, would marry that feisty woman who would later die at the age of 57. Our tour guide told us so many great stories about Marjorie and how she was able to live in that desolate area, keep the homestead going and the orchards alive. She later wrote in her journals that the orchards broke even and never made money all those years. She did hire help often to help with chores around the home but became very close to her maid, GeeChee. The movie Cross Creek is a biography of her life when she first came to the area and her struggles to publish her novels. It’s worth watching. When she first came to Cross Creek, the house was just the one building shown on the far left of the picture above. Later she would add a 2 bedroom and 2 bath extension. One room for guests and one master bedroom for herself. In 2007, her home was designated as a National Historic Landmark. A view of the back of the home with the kitchen and dining area on the right of the picture above. 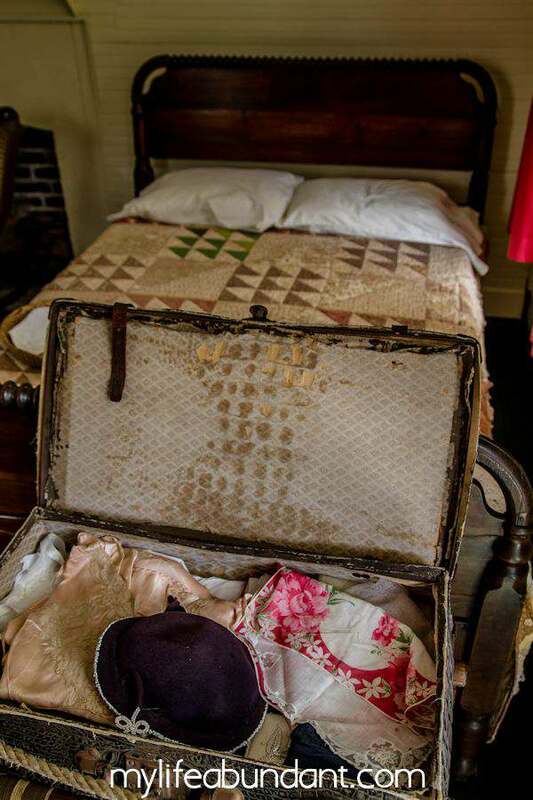 When you first walk into the front porch of the home, you will notice a bed. Very normal for southern homes to have a “sleeping porch” for those hot summer nights. The porch is where she also did a lot of her writing from the typewriter above. Lovely living room area with fireplace and so typical for smaller southern homes. Windows and doors strategically placed to always have cross ventilation when it was hot outside. 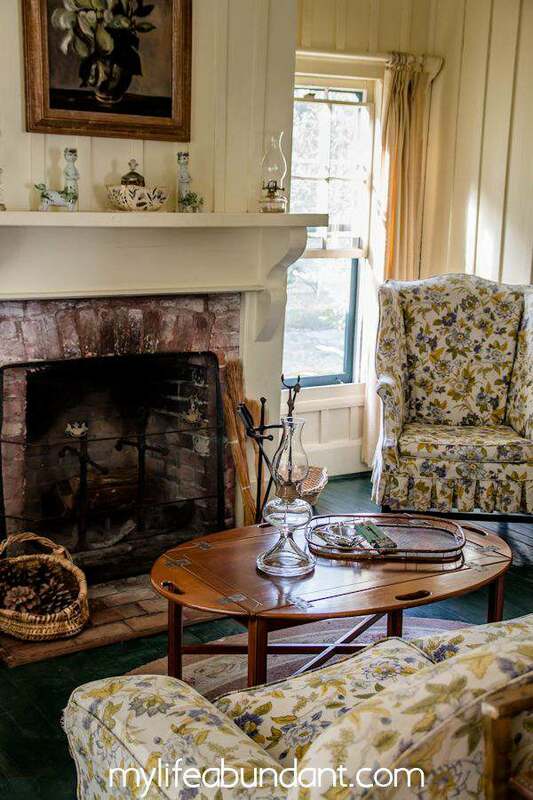 Each room has a fireplace and simple furniture for the time period. That bed was brought to her as a welcoming gift to the neighborhood, so to speak, by her neighbor on the back of a mule. After living there for awhile, she had running water and electricity run through the home. I love the linoleum she has in the two bathrooms. Still just as beautiful as the day she had it put in. 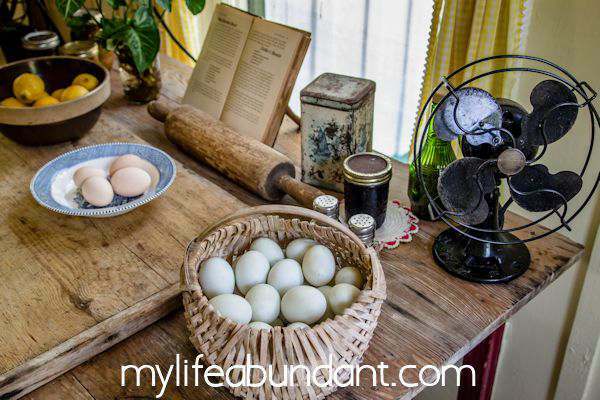 It’s been 75 years since she wrote the book Cross Creek and this year will be a year-long celebration at her homestead where cooking classes will be held once a month. I’m hoping I will be able to join in on that fun. Here cookbook was published in 1942 and if you love old-fashioned down-home cooking, then this book is for you. And for me too!! 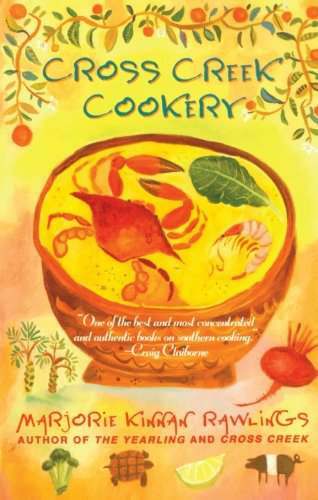 It’s full of tidal deep south recipes and also some delightful anecdotes and lore. Being a gardener, I fell in love with this simple country garden with the chicken coupe sitting close by. I could spend many hours there just digging in the dirt. The garden is still planted with seasonal veggies and flowers all year long to use in their demonstrations of cooking classes. If you find yourself close to Gainsville, FL and want to slow it down a bit and see how it used to be. Take the side road and head to Cross Creek and spend some time at Marjorie’s farm. You will surely love the tour as much as we did. Wow! I went there about 15 years ago and forgot how lovely it is out there! I think I’ll take my kids up there to see it. Beautiful post! I love visiting places like this that are preserved in another time period. I read the Yearling when I was young but I’ve never heard of Cross Creek. I love that they maintain the garden there. Such a nice home. HI Tara. Every year they close the house down for about a month to completely go over it to repair and maintain it. This house just truly impressed me. Thanks for stopping by. That was quite a home and it was a fantastic feeling to get back in time and seeing the exact place as it was. Thank you for this, I very much appreciate it. I have never been to this place and never heard about it. However, enjoyed reading it. Wow very interesting to get a peek into this author’s house. It would make me like her books even more, because of this new connection. Looks like a very peaceful serene farm life. What a beautiful home, love how well maintained it is. 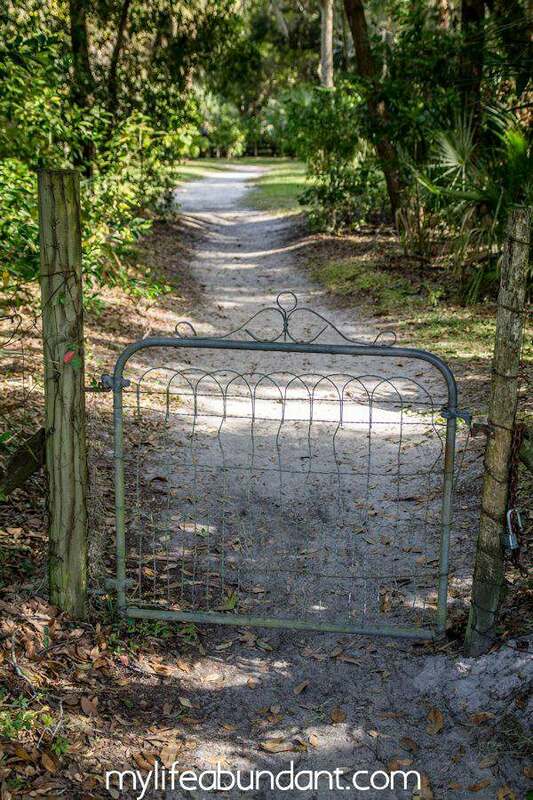 I will definitely visit Marjorie’s Farm if I ever get to visit Gainesville. It would be surreal to be in the same place where a well renowned writer used to live and work on her novels! Thanks for the virtual tour. I enjoyed viewing the photos and learning a little about Ms. Rawling’s humble beginnings. These pictures just draw me in and they tell their own story. Such a simpler time and place. Family togetherness was so important and everyone helped out completely. Looks pretty fabulous! So pretty, I love visiting older places like these but don’t get a chance to often. I would love to check it out if we ever visit over there! What a lovely post about Marjorie Rawlings. I plan to come down that way soon. I will definitely stop by there. This was such a great read! Those pictures are absolutely incredible – I loved this! Thank you Lynzy and thanks for stopping by. This tour was definitely amazing! I can not believe that she became a writer at the age of 6. I love visiting place like this. It looks so well preserved and to get a peek of the author. I really enjoyed reading this article. Love the pictures and you explained them so well. I hope to visit this place one day. WOW. I love the simplicity of the house, but it’s charming at the same time. I guess I’m an old soul, too. I am impressed with how the house and the stuff inside have been preserved. Do they charge fees for the house tour? Wow what a special place to visit! I love how it is like a moment in time frozen to preserve the history. What a beautiful homestead. It really looks like it has been kept in great condition. 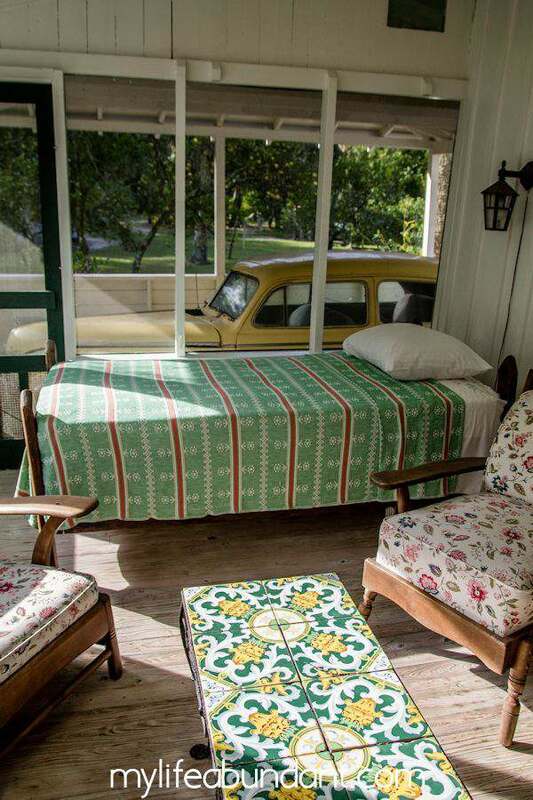 I would love a porch bed with a screened in porch…however, not sure what my neighbors would think though. I’m a big fan. I can’t wait to take this tour during my next visit. the place looks indeed lovely! it feels like i’m back to old days when i’m back in our farm back in australia far away from noisy cars, planting foods, harvesting eggs and very easy simple life. I love those old things they have there must see! Marjorie’s farm looks like an amazing place to visit! 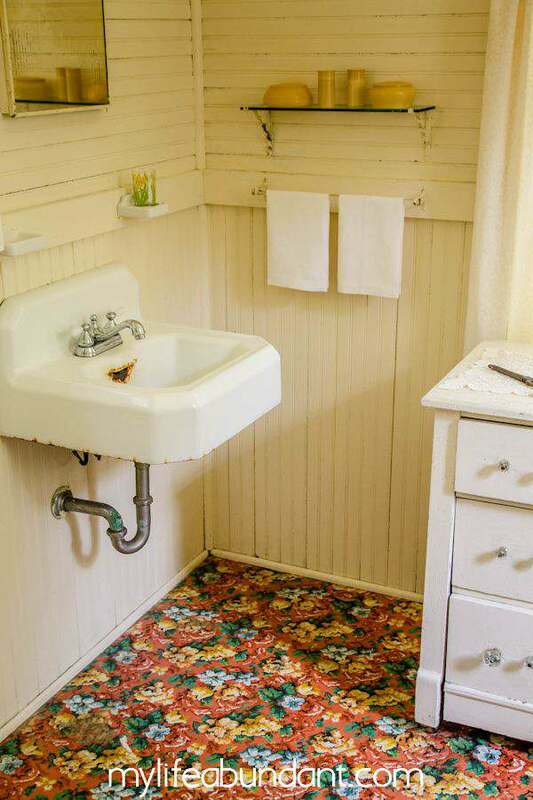 Her house looks so adorable, and I like the bathroom linoleum too! This is so neat! I had no idea her home was still there, much less that you are able to visit it! I’m so glad you posted this! it looks so peaceful and tranquil. The perfect place to be inspired for writing. 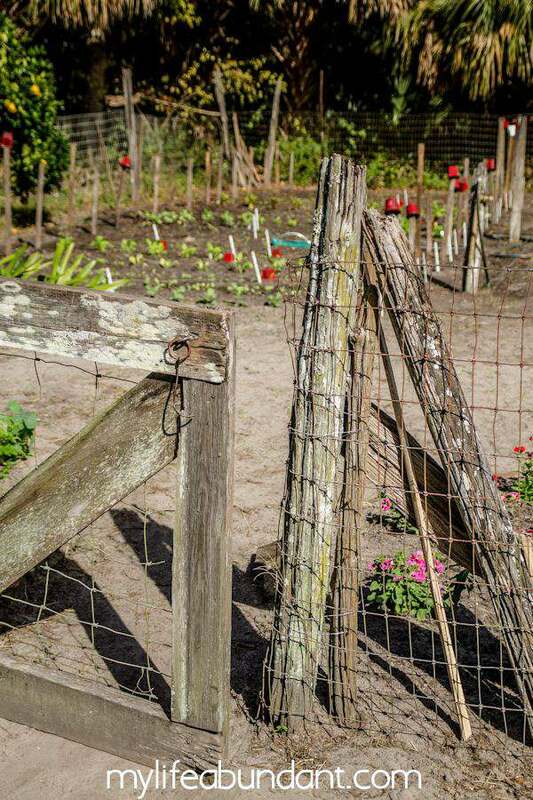 And cooking obviously – the vegetable garden is amazing! How wonderful that they’ve maintained it. It is nice to take a step back in time. What an amazing experience! It always puts things into perspective when you can actually visit these people’s homes. I just got back from New Orleans and was able to visit Anne Rice’s home – I love all of her books! That is so cool! I have never heard of her, but am only a few hours away so I think a road trip is in the future! I havnt heard of this place but looks truly beautiful! I love old fashion buildings and furniture it really amazes me how they used to live so would definatly love to go and visit this place one day! This is so cool to see. I enjoyed looking at all the photos. I love seeing things from the early 1900s. It is crazy to think how they lived with so little compated to the things we have today. They also relied on each other more in those times. It took a village to maintain a farm and a family. I love the movie Cross Creek. It is one of those that sticks in your mind. I’ve been to visit the area where she lived once, and it was exactly like you would imagine. Only a great writer could be so inspired by another awesome writer. This sounds so awesome. I think I might have seen the Yearling when I was younger. This year is definitely a year that I want to take time to explore places and things I have not yet seen. What a great step back into time! 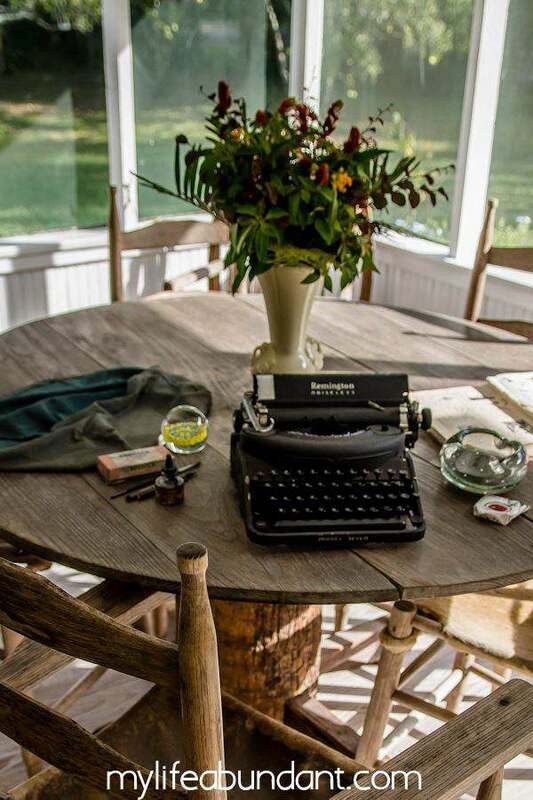 I love the old typewriter and the sleeping porch is awesome. I would love to take my kids to visit one day soon. I think it would be a great way to take them back in time. She sounds like an amazing woman. I love to visit historical homes. If we are ever in the area I will stop by for sure. Oh that is so cool! I love visiting places like this where time has been put on pause. It’s so interesting. Thanks for sharing this! I love hearing about destinations like these. A step back in time is pretty awesome. I’ve always admired what previous generations have done. So fascinating! 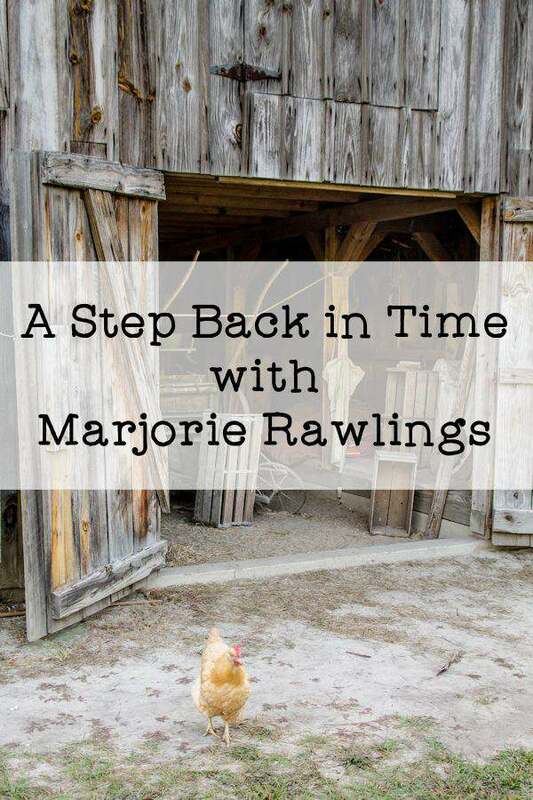 The Marjorie Rawling,s farm would be a step back in time and I would so love to visit it some day. Cross Creek is a movie I will have to see. She was indeed a strong willed woman. Thanks for sharing your experience and the information. I love exploring places like this. I haven’t been to Gainsville, FL in awhile but now I have a reason to. I’d love to visit this place. I could easily walk away from it all and live in a place like that. It seems like such a marvelous way to live. Her house looks so cozy and the farm is definitely a place to relax. She sounds like an amazing woman and she definitely deserve the recognition for her work. She has managed to build such a lovely abode. Omg! This is exactly what I need a peaceful place, I should need to go there so I can concentrate to all my work and besides I’m so depress this past few weeks and stay at home makes me crazy I can’t finish all my works. I love to visit in a place like this looks relaxing and I can forget all my problems. I would love to visit her place some day. I love gardening and used to have chickens so I really love this post. Gainsville, FL is just a few hours from my hometown Fort Myers. Would have been lovely to visit Majorie’s farm while I lived there. So beautiful and charming. Love the images you captured. It’s amazing to be able to visit a place so charming! Thank you Hali for the sweet compliment. Please come back again. It is beautiful! Thank you for the step back in time! I wish I lived then!